"The fake-orchestra machine you cited has been banned by the musician's union - and not without a fight! We are convinced that New Yorkers not only know the difference, but will continue to demand the kind of rare live performances one can find only in a Broadway pit." Better late than never: last Saturday, I made my way up to the Gilman Opera House at BAM to see the Brooklyn Philharmonic, in a concert of English and American music. First was a robust performance of Vaughn Williams' Fantasia on a Theme of Thomas Tallis, preceded by a dramatic candlelit performance of Tallis' original psalm. 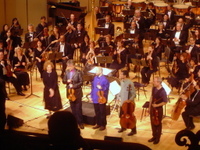 The centerpiece of the program was the New York premiere of Julia Wolfe's My Beautiful Scream, featuring all four members of the Kronos Quartet. The work was written in the aftermath of 9/11, which Wolfe says was a wonderful time for her and her family, despite the disruption to her downtown Manhattan home. Wolfe, who is a founding member of Bang on a Can, calls for the quartet to be amplified, which is the only way they could be heard above the din of the full orchestra, as they replicated the sounds of police sirens and people screaming. The overall effect was evocative and disturbing, fully deserving of a place in the repertoire alongside John Adams' Pulitzer Prize-winning On the Transmigration of Souls. 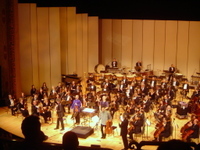 The concert concluded with Gustav Holst's The Planets, which, from the looks of the many "University of Mars" T-shirts, was the main draw for a large percentage of the sold-out house. The live perform ace was accompanied by close-up video projections of the planets, courtesy of NASA and the Jet Propulsion Laboratory. Personally, I felt the images, while engaging, distracted from the performance. Holst didn't write this music as a literal representation of the planets; rather, he sought to invoke the gods for whom they were named. Still, the crowd clearly was into it, and gave a big ovation afterwards. 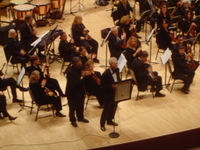 In a panel discussion after the concert, conductor Stefan Asbury remarked that he didn't see any difference between the various selection on the program. It's all a matter of perspective. "Holst was also a living composer," he said. "All music was new at one point." The final subscription concert of the Brooklyn Philharmonic's season is on May 12, and features a dramatic staging of Henryk Gorecki's Symphony No. 3 (1976), which became hugely popular after the hit 1992 recording with Dawn Upshaw and the London Sinfonietta. The Bklyn Phil will also be presenting a series of free outdoor concerts this July, including a performance at the Prospect Park Bandshell on July 14 featuring composer/violinist Mark O'Connor and cellist Maya Beiser. "I often feel really considerable internal dissonance when I have to stop being a composer and jump on a plane and transform myself into a public person, a conductor who can relate comfortably to a stage full of 100 musicians and a hall full of several thousand people. But in the end it's a good experience...It's a psychologically healthy thing to do, moving back and forth from creative work to performing. I think each activity nourishes the other." For those unfamiliar with John Adams or his music: he was born in New Hampshire in 1947 and studied composition at Harvard, steeped in the Serialism that was the dominant compositional style of the 60's. In reaction to what he regarded as an oppressive academic orthodoxy, he fled to California in 1971, landing at Berkeley, where he has lived ever since. There, he encountered the minimalists Terry Riley and Steve Reich, and combined many of their techniques with the Romantic idioms of harmony and rhythm. In the 80's, he began to focus on orchestral music, developing an accessible, dynamic sound which he refers to as, "massed sonorities riding on great rippling waves of energy." 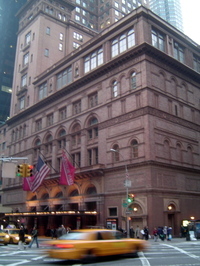 His music continued to evolve through the 90's and into this decade, resulting in such modern masterpieces as Harmonium and Harmonielehre, the Pulitzer Prize-winning On the Transmigration of Souls, and the operas Nixon in China, The Death of Klinghoffer, and Doctor Atomic, which will receive it's Met Opera debut in 2008. The Wound-Dresser, from 1988, sets the Walt Whitman poem about his experiences as a nurse in a Civil War military hospital. The images of amputees and open wounds were graphic and disturbing, and the parallels to the current conflict in Iraq - not to mention the controversy surrounding Walter Reade Army Medical Center - were impossible to ignore. Eric Owens, the bass-baritone who sang the role of Gen. Wesley Groves in the world premiere performance of Doctor Atomic, was a majestic presence onstage. 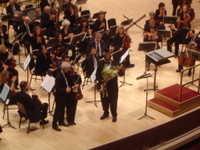 After intermission, Adams was awarded the American Composers Orchestra's Distinguished Composer Award, and in his acceptance speech, he thanked Carnegie Hall for giving him the opportunity to be composer-in-residence, and predicted a bright future under the leadership of Executive Director Clive Gillinson, who has already spearheaded new education and outreach initiatives, similar to those he initiated as director of the London Symphony Orchestra. The concert ended with the Violin Concerto (1993), performed by the 29-year old Canadian Leila Josefowicz. Adams says this work marked a transition for him, forcing him to write melody - or "hypermelody", as he calls it - which is absent from most of his earlier music. 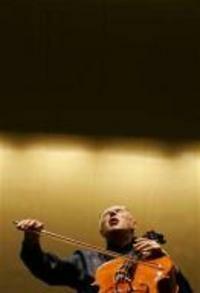 It does, however, share with those works the gradual build to a dramatic finale - in this case, the Toccare, which sends the violinist into a rapturous, non-stop explosion of sound. Josefowicz, who recorded this concerto in 2002 with Adams and the BBC Orchestra, seemed completely taken over by it, playing with fiery passion. When the music finally ended, Adams embraced Josefowicz like a proud papa, and the crowd leapt to it's feet in ecstatic applause. Adams is nothing if not a crowd-pleaser, saving his best for last. "The music of John Adams, unlike so much classical composition of the last fifty years, has the immediate power to enchant... If you had to sum up his music in a single metaphor, you might say that it sounds like California's Highway 1. It is a cut-up paradise, a sequence of familiar elements arranged in unfamiliar ways. His music, in spite of its discontinuities, has a unifying hum, as if riding on fresh asphalt."